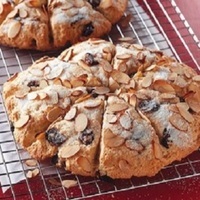 Cherry Scones is a delicious, and moist recipe for a true English scone made with either dried cherries or dried cranberries and almonds. A great addition to your breakfast and or brunch meal rotation. Great for overnight guests or large gatherings. Not at all dry like many scones. It is also a low calories, low fat, low sodium, low cholesterol, low carbohydrates, heart-healthy and Weight Watchers (5) PointsPlus per serving recipe. Place all topping ingredients in a bowl; mix well. Set aside. Combine flour, sugar, baking powder and salt in another bowl; cut in butter with pastry blender or fork until mixture resembles coarse crumbs. Combine sour cream, egg and almond extract in another bowl; mix until smooth. Stir into flour mixture just until moistened. Stir in cherries. Turn dough onto a lightly floured surface; knead 8-10 times until smooth, adding a small amount of flour, if necessary. Divide dough in half. Pat each half into a 7 inch circle. Place 2 inches apart onto large ungreased baking sheet. Sprinkle topping evenly over dough. Score each half into 8 wedges; do not separate. Bake 25-30 minutes or until scones are lightly browned. Cool 15 minutes; separate scones. Store leftover scones in airtight container at room temperature. That looks nice. I'm sure its awesome too!